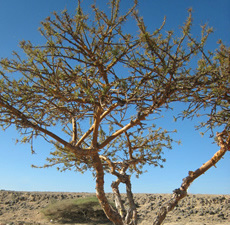 Traditional Use: Frankincense has a long history as incense. It was burned by the Egyptians and is used in many religious ceremonies. Traditionally it has also been used for skin ailments from acne to wound healing. Benefits: Acne, anxiety, asthma, blemishes, bronchitis, colds, coughs, dry skin, flu, nervousness, rheumatism, scars, skin ailments, stress, ulcers, urinary tract infections, wrinkles, wounds. To take advantage of some of the skin healing properties of this oil it may be added to skin creams or toners. Of Interest: Frankincense has many other names that it is known as. Most commonly you will see it as frankincense, olibanum, or boswellia.